"Many stories attached to the 400-year old history of this live oak. Some say that, during the days of the Republic of Texas (1836-1845), at least eleven criminals were hanged from its graceful boughs. Although others dispute the tales, the legend survives." After making a statement to the press by the Old Hanging Tree, Deric Muhammad said everyone will start marching at 11:50am towards city hall, the site of the rally. Hundreds of people are expected to be in attendance and the media is buzzing. Also the Fire Captain involved with the original noose incident, issued an apology with the NAACP standing in support of him on July 27. 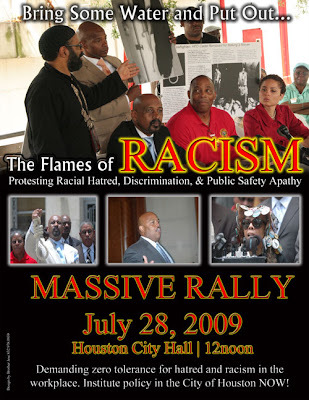 The Houston NAACP is siding with him and saying that this is not an issue of race. His apology was not accepted by Otis Jordan and the Houston Black Firefighters Association. More updates after the rally. The Final Call will be on deck.